Refer your friends to Bigpipe & get free internet! So… you’re a Bigpipe customer, deeply and passionately in love with our unlimited data and no contract plans. You want to tell the world all about Bigpipe, share the love with your friends, colleagues, and anybody who will listen. We figured we’d make it easy for you. We’ve made it so you can get $20 for every friend you refer to Bigpipe, leaving you with more cash each month to spend on the important things in life, like streaming movies, Sour Skittles, Burger Rings, and Steam sales. Oh, and whoever you refer will get $20 credit as well. Nice! So, here, in three easy steps, is how to get free broadband by doing virtually nothing. Log in to your Bigpipe account on our website, and you’ll see a lovely little widget like this. Each Bigpipe customer has a unique link (it’s right there in the middle of the widget. Yours will have a bunch of letters and numbers after where it says “referralCode=”). Simply share that link (just click “Copy link”) with your friends, acquaintances, colleagues, family, lovers, mortal enemies. Anybody, really. Stef M here clicked our handy Twitter link to tell his followers all about Bigpipe. Good for you, Stef M! You go, Stef M! That’s right. There is no step 3. You don’t have to do anything else. 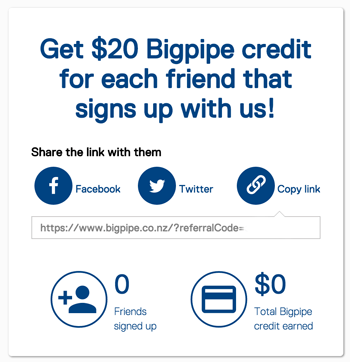 If your friend/acquaintance/enemy sign ups using that link they’ll earn $20 for you in Bigpipe credit. They will also earn an extra $20 in credit for themselves too, just for being your friend/acquaintance/enemy – and that’s on top of any other offer we might have at the time too. It all gets automatically applied to your account – you don’t have to put in any special claim, and they don’t have to mention your name or anything. Much like our broadband, our Refer A Friend service is unlimited – there’s no limit to how many people you can refer and how much Bigpipe credit you can earn. So how do you get people to use that link? We’ve made that part nice and easy too. We provide a handy button to post it directly to your Facebook page or to your Twitter account. There is also a button to copy the link and paste it anywhere on the internet – preferably where people will see it, and especially people who might be unhappy with their current ISP and in need of some Bigpipe love. We’re sure you’re smart enough to figure out where unhappy customers of other ISPs might hang out on the internets. The more people who see the link, the more likely you are to get those dollars flowing. It only takes a few referrals to pay your entire bill for a month. How much Bigpipe credit can I earn?